Rich soil with plenty of compost mixed in before planting. Weekly liquid feed or seaweed drench from mid summer onwards. Marigold, Broccoli, Chives, Mint, Borage, Parsley, Basil, Pepper, Asparagus, Monarda, Lettuce, Garlic, Dill and Calendula. Start seedlings indoors or start with purchased plants. Set out after the last frost has passed, when the soil is warm and settled. Bushy determinate plants can be tied to stakes, but long-bearing indeterminate varieties need a sturdy cage or trellis. Pick regularly as soon as the fruits turn color but are still firm. Store at room temperature. Watch for leaf-eating tomato hornworms, and pick them off. 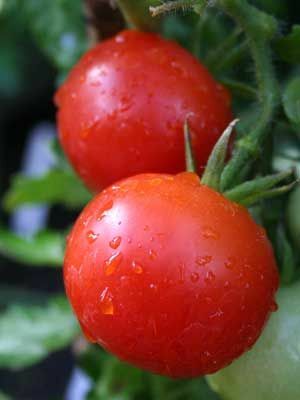 Black patches on the bottom of fruits are a nutritional disorder best prevented by growing tomatoes in well-prepared soil with constant light moisture.